Hello everyone, I hope you all a great day. I've been thinking of posting some of my very old posts that have been written in one of my oldest blogs and maybe move them in this current blog. I got so many posts, but I will pick the best of it because back when I started blogging I didn't have that much of experience. The reason why I want to do this is that I got pretty good posts back then when I started blogging and keeping them would be a good way to remember how I started and what I posted before. Though I wasn't that good at grammar which will not be a good thing to just copy and paste them here. I'm going to re-write them again and correct all the mistake. I got tutorials and other ideas back then and I actually, did a couple of posts each idea or topic, but then for some reasons, I stopped blogging in the blog which made it dead now. I'm not going to get back to it and soon when I finish moving my favorite posts to this blog I might delete the blog. Everything from now on will be my main stuff which I will be focusing on for the rest of my life and develop them and grow. I have new plans and amazing things for the future of this blog and my social media. I'm going to share more epic photos in my social accounts and posts here and I'm going to do new ideas and awesome stuff. My first ever idea I will be sharing on this blog from my old blog will be the 'Five-list' which I mention 5 things and discuss it. I mention 5 things each post which could be things we do or have as bloggers or anyone. Also, I like to share my favorite stuff and let you guys know me more. I'm going to share five things of my favorite list in everything. 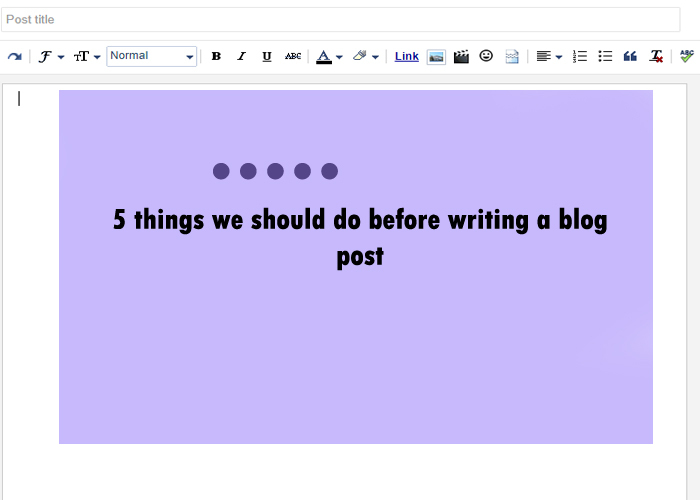 The first post I did before when I started this was about blogging and I shared my perspective on five things we should do before start writing a blog post. I wasn't sure that the post would get good feedback, but it did which is great and I hope it will still get good feedback today and I hope you guys will find it somehow helpful for you. I have experienced this several times, every time I start writing the blog post, I get dizzy and come back later when I have eaten something and I find my post wasn't the best because when blogging hungry you will not have the same energy as the person who is not. Everything in our bodies uses energy and considering eating before blogging is necessary. I'm not saying that you have to eat even if you not hungry, but in case you are, I think you should. You could add snacks to the desk set which what I always do when writing a blog post. I put snacks close to my laptop and eat a piece every two or three minutes until I get full and it helped me so far because I can blog while don't have to worry about eating before blogging or anything. Allowing the brain to get a fresh air during blogging will help to work appropriately and much better than blogging in a closed area. I have tried this several times and I found huge differents which made me love it. I wrote a couple of posts in our backyard while getting a fresh air and it helped me a lot to write good articles because I think when having an open area the mind will be more open for new ideas and words. You still can get a fresh air while blogging inside the house if you open the windows and let the door open to help the winds get through the window. I've been doing this when I can't blog a post in our backyard. This is the most experienced and I still facing problems with getting a quiet place to blog because our house is a madhouse. Kids and people in the house always make noise and it really bothers me because I can't think straight while blogging in a place where it's noisy all around. There is a lot of things we can't do when blogging in a place surround by noises and sometimes I have to go outside the house to blog or wait till it gets quiet which never going to happen, but luckily it happens sometimes. I think it's necessary even when we are not blogging because keeping ourselves hydrated when using electronic devices is an important thing for our health. I always put a bottle of water next to my laptop and drink every couple of minutes even when I'm not blogging. This is actually good because when we get thirsty we don't have to get up and go grab the bottle. It saves time and energy which is great. Always aim to keep yourself fresh and healthy while using any electronic device. This is important and necessary if you would like to have a good and nice post, choose the right time. I would say, the right time is not only for a specific hour or minute, but it's also how you feel because sometimes you feel good late at night that you can write a post which is good and still you will do good, but also you need to choose the right time because blogging at time when its sleeping time won't let you do better. Choosing the right time differs from person to another because it's obvious that we all not the same, but we have to pick our time and we are common on this one. What is your favorite time for blogging? comment it down below. This is everything and I hope you will find it somehow helpful to you. I wrote the post again and fixed everything except the concept. I'm going to develop this topic and add more amazing posts for you in the future. For now, I'm signing off and hope you a great day. I definitely agree with eating. I focus better when I'm not hungry. I wish I could blog in a quiet space, but unless I get up really early or stay up late, that doesn't happen with two little kids in the house! It's actually super interesting to me how opposite of this I am. I need to be in the same spot to write. If I go to a coffee shop or different room I get distracted and never end up working. However I love to go to other spaces, jot down ideas, and then parse them out in my actual writing space. That said water is so important and I have a water bottle that only leaves my desk when it's being filled or washed! Thank you for sharing this, came right on time... I've been feeling not productive enough. I think eating before starting is a great tip! A great article with specific guidelines for writing. The writer will easily write a good article after applying the above suggestions. I love that these are environmental things, not necessary technical things. I find I always write better with snacks and my essential oil diffuser going. Especially with peppermint diffusing! Great tips, I like that you mention the environment. I have the hardest time working on post when the room is noisy. Great tips for us bloggers! Much Appreciated, especially the eating part.